America the Beautiful wreath is understated in its simplicity. It's Made in America of course. The stars & stripes of the patriotic fabric bow are gorgeous atop the fresh greens. Ready to ship and guaranteed to arrive forest fresh. You will want to display this for a long time. 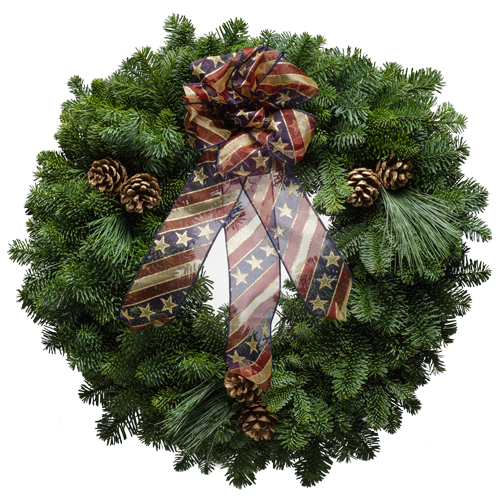 "I received nothing but wonderful and gracious thank you announcements when the wreaths arrived. Everyone who was lucky enough to receive a Christmas Forest wreath has commented on how full and well made they are and how wonderful the Christmas wreaths smell! This is exactly the response I love receiving this time of year."